David Edwards is ready to text (or rather ‘whaf’) you a virtual espresso – from Australia. And that’s just your wake up call. How about an Aero-Shot chocolate bar you can savour – without (gulp!) — Hey, we don’t swallow….We inhale. According to David Edwards the Harvard/MIT professor and founder of Le Laboratoire some huge % of flavor (can’t remember exact figure) is in the smell. And all the vitamins etc. are transferred without the bulk or the calories! Hard to believe, but heck. I’d love to prepare my finals with all the kick of Red Bull and none of the DTs. Or indulge a choco-holic’s dream sans the belly fat. Blasting through the gimmick stage it’s easy to imagine ‘serious’ applications in perfumery, medicine, nutrition, warfare, or (why not?) peace. 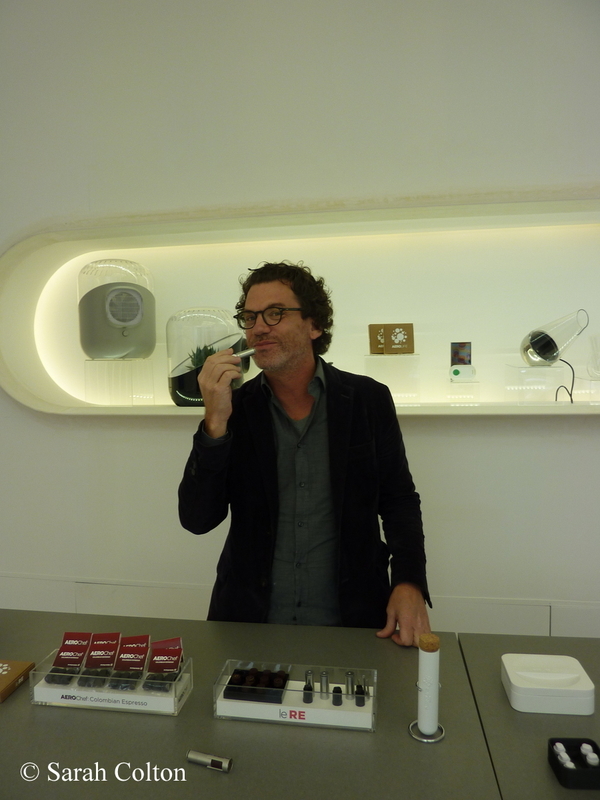 Meanwhile, Givaudan and Orange have teamed up with Le Laboratoire for the coffee stage. Olivier Pescheux, Givaudan perfumer has concocted some tasty, no smelly, oops no, forget it, sensational Toby’s Estate brews. But don’t trust me. Smelling is believeing. Chocolate, coffee, and cocktail ‘clouds’ on tap at Le Laboratoire bar. Move over, George Clooney, you’ve just been whaffed.